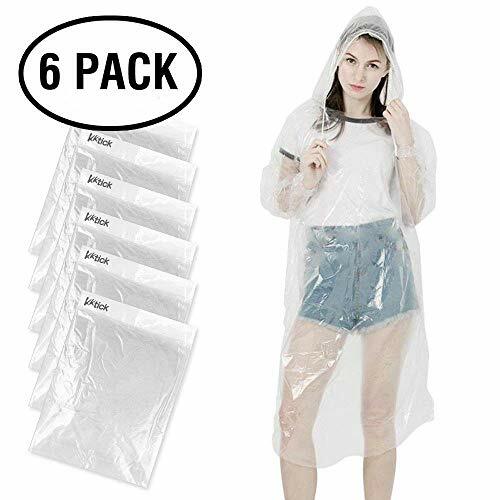 SUPER WATERPROOF: The poncho 6-pack made with high quality PE material thickness 0.025mm, extra thicker, which is durable to protect you well in rainy days. INCLUDES DRAWSTRING HOOD: Each portable rain poncho includes drawstring hoods to reinforce water protection around head and neck area. Easy to store in your bag as it's compact and lightweight. 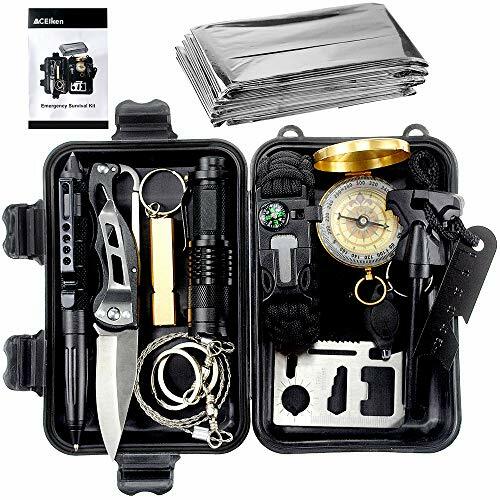 FOR MULTI ACTIVITIES: A good emergency kit perfect for various outdoor activities: disney, theme parks, camping, hiking, backpacking, outdoor survival, fishing, traveling, backpack trips, festivals, sports events. ONE SIZE FIT ALL: Disposable Raincoat with attached hood and elastic cuff, it's a perfect emergency poncho suitable for both adult and youth, men and women, girls and boys. 100% MONEY BACK GUARANTEE- Our clear ponchos are backed by our 100% guarantee that you are satisfied with our product or your full money back. 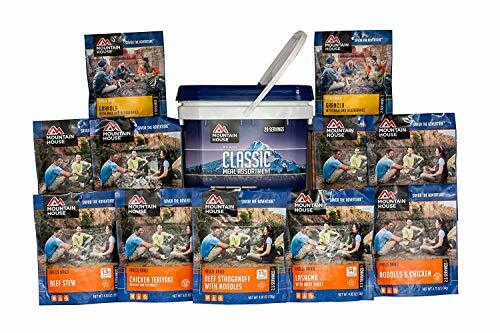 Mountain House serves up an easily portable, great tasting combo of our classic entrees including a breakfast, in a super lightweight reusable bucket that can be efficiently stored and organized for your emergency food supply, camping food kit, or long-term food storage. The Classic bucket contains 12 total meals with enough food to feed a person for 3. 5 days*. Each Classic Bucket contains two each Beef Stroganoff with Noodles, Chicken Teriyaki with Rice, Beef Stew, Lasagna with Meat Sauce, Noodle & Chicken and Granola with Milk and Blueberries. Every pouch in this bucket is backed by a 30-Year Taste due to our proven 30-year shelf life. Contains 12 total pouches, two each Beef Stroganoff with Noodles, Chicken Teriyaki with Rice, Beef Stew, Lasagna with Meat Sauce, Noodles & Chicken, and Granola with Milk & Blueberries. Bucket contains 29 total servings. 30-Year Taste . Packaging May Vary. Use for emergency food storage, survival food, camping trips, backcountry hiking, RV expeditions and more! 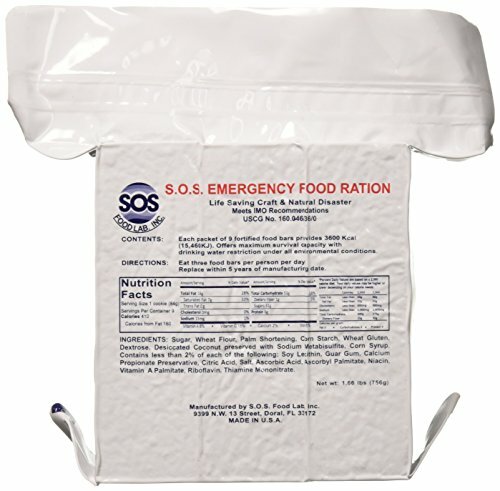 SOS Rations emergency 3600 calorie food bar - 3 day/72 hour package with 5 year shelf life net wt. 1.60lbs (756G) 15, 075 kj. 3600 kcal per package. High energy value. Ready to eat. Perfect for anyone in the process of building a disaster/emergency Kit. The SOS emergency food rations are us Coast guard approved and has a shelf life of 5 years from the date of manufacture. Content: each package contains 9 delicious bars providing 410 calories per bar Totaling over 3600 calories per package. Non-thirst provoking formula offers maximum survival capacity with drinking water restriction under all environmental conditions. Directions: eat three food bars per person per day. Manufactured by: SOS Food Labs, Inc. The perfectly designed outdoor eating utensil, the Light My Fire spoon-fork-knife combo brings a bit of civilization to the wild and a bit of the wild to civilization. Triton plastic is BPA-free, won't scratch cookware, won't melt in in boiling water and is dishwasher safe. The Spork is perfect for your backpack, boat, picnic basket, lunchbox, purse or briefcase. Designed especially for Light My Fire by Scandinavian designer Joachim Norwell. 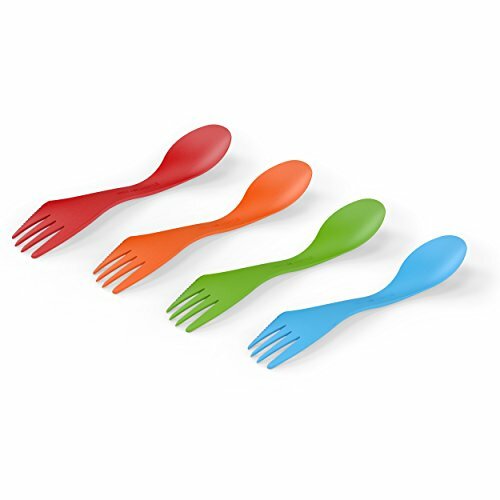 Package of 4 Sporks. Spoon-fork-knife combo with a serrated edge on side of fork. 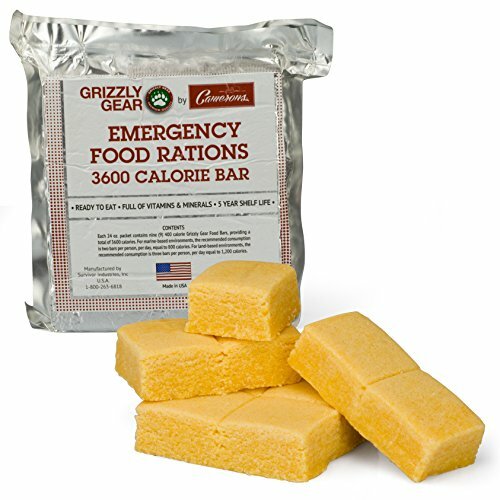 Emergency Food Bar Rations - Survival Gear: 3600 Calorie Bar of Ready-to-Eat Rations: These ready-to-eat food rations are full of essential vitamins and minerals, and are designed to ensure survival during catastrophic events. With a lengthy 5 year shelf life you are sure to have a long lasting product for those "Just in case" moments. Each package contains 9 pre-measured 400 calorie rations, which allows a person to get their full nutrition in a challenging situation. Each complete food bar is packaged in a water resistant, highly durable, and air sealed Mylar packaging. For marine based environments, the recommended consumption is two squares per person, per day or 800 calories. For land based environments, the recommended consumption is three bars per person per day, or 1200 calories. Made in the USA. 1 lb 8 Oz. The waterBOB is a water containment system that holds up to 100 gallons of fresh drinking water in any standard bathtub in the event of an emergency. Constructed of heavy duty food grade plastic, the waterBOB keeps water fresh and clean for drinking, cooking, washing and flushing. Water stored in an open bathtub, with dirt, soap film and exposure to debris will spoil and become useless. During a hurricane or tropical storm, water main breaks and storm surges can interrupt or even contaminate your water supply. It is during these conditions the waterBOB may be used for temporary water storage. Constructed of heavy duty plastic that is FDA compliant for food storage, the waterBOB keeps water fresh and clean for up to 4 weeks. 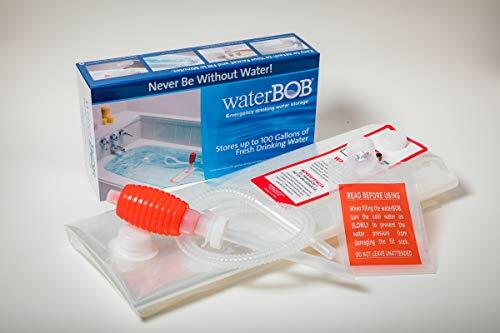 The waterBOB is very easy to use. Simply lay the liner in any standard bathtub, attach the fill sock to the faucet and fill the bladder to capacity, which takes approximately 20 minutes. A siphon pump is included to easily dispense the water into jugs or pitchers. Never wait in line again to buy expensive bottled water! Be prepared with the waterBOB. COLLECT DRINKING WATER IN YOUR BATHTUB: The waterBOB is a water containment system that holds up to 100 gallons of fresh drinking water in any standard bathtub in the event of an emergency. Don't wait in line to buy expensive bottled water or worry about keeping large barrels or tanks. Collect drinking water in the large container that you already have-your bathtub! PREPARE FOR EMERGENCIES: Never be without water in an emergency. During a hurricane or tropical storm, water main breaks and storm surges can interrupt or even contaminate your water supply. This is when the waterBOB comes in handy as a temporary water storage system. Don't be caught unprepared for an emergency. Feel safer by purchasing a waterBOB today! KEEPS WATER CLEAN FOR DRINKING: Water stored in an open bathtub with dirt, soap film, and exposure to debris will spoil and become useless. WaterBOB lets you negate these health risks and make your bathtub a clean and fresh water storage container that can keep water fresh for up to 16 weeks depending on the water source. Keep your water clean for drinking, cooking, washing, and flushing. EASY TO USE: The waterBOB is simple to use for both storing water and using it for your everyday needs. Simply lay the liner in any standard bathtub, attach the fill sock to the faucet, and fill the bladder to capacity, which takes approximately 20 minutes. A siphon pump is included to easily dispense the water into jugs or pitchers, making it easy to use your water every day. BPA-FREE AND MADE OF USFDA-APPROVED MATERIALS: The waterBOB is constructed of heavy-duty, food-grade plastic that is FDA compliant for food storage. Our material is also completely BPA-free. Feel confident that you will be prepared for any emergency with our top-quality materials. Put your trust in waterBOB and feel safe with a clean and fresh water storage solution. 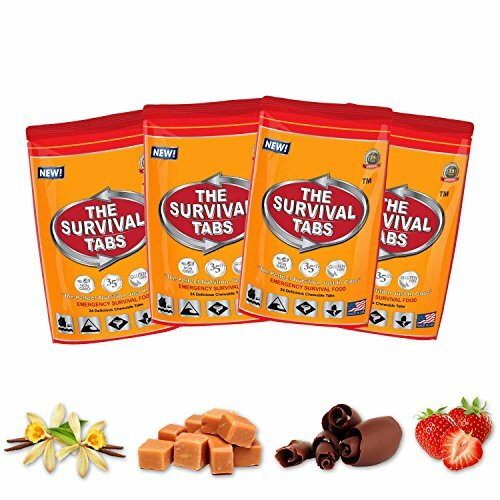 The Survival Tabs contain 100% of the U.S. RDA of 15 Essential Vitamins & Minerals. Made with the highest quality protein which is essential in survival situations where your body needs to assimilate as much as possible from what you eat. Generally, of the food we eat, most is not absorbed as an effective use of calories . A calorie is basically a unit of energy that our bodies need to keep going. Our bodies use calories much like a car uses fuel. Because The Survival Tabs are 100% digestible and assimilated into your system, they use all of the calories to fuel your body. Combined with high-quality protein , fatty acids and carbohydrates, The Survival Tabs are an efficient means to nourish your body. The greatest possible nutrition in the smallest possible volume. We have samples of The Survival Tabs that were produced in 1974-75. They have been stored at room temperature. We test them periodically and have found little, if any, deterioration or loss of vitamin or food value. Our results showed negligible loss in these areas. Freezing temperatures will have no effect at all on these tablets. We would estimate the shelf-life is 25 years, but suggest rotating them to ensure maximum food value every 2-3 years. The Survival Tabs contains: Fat 25%, Protein 9%, Carbohydrates 58%, Iron 18 mg. (as Ferrous Fumarate), other minerals, 2% (from milk solids), and the following vitamins in percentages shown of their USRDA adult allowance. There are approximately 20 calories in a 3.9 gram The Survival Tab. Package Includes: - 4 x 24-tab pouch (Each pouch is 1 flavor: Butterscotch, Vanilla, Strawberry, Chocolate). Contain 100% of 15 Essential Vitamins & Minerals. Made with the highest quality protein. GLUTEN FREE and NON-GMO. The 'Just in Case' Food Supply, The Survival Tabs backup for the situations such as natural disasters. This is the best possible food in the smallest possible volume. Created to supply the body with all the daily essential vitamins and minerals needed when facing uncertainty. The compact design allows for easy storage and is perfect for individual emergency kits. This convenient portable, personal pouches will sustain a person for 8 days | This calculation is based upon one average person. Consumption requirements may vary from person to person. Flavor: Mixed Flavor - Each pouch is 1 flavor - Butterscotch, Vanilla, Strawberry and Chocolate. | Contains: 24 Tablets x 4 pouches = 96 Tablets. | Servings: 12 Chewable Tablets - 20 Calories per tab. Weight: Approximately 10 ounces per pouch. Dimensions (inches): 5.5 x 8.5 x 2.75 (W x H x L). The compass included features 360 degree rotating bezel for easy navigation & orienteering. Waterproof and shake-proof with luminous display inside, convenient and clear viewing at night. 2-Position Wrench, Butterfly Screw Wrench, Direction Ancillary Wrench, Screwdriver, Knife Edge, Saw Blade, Ruler, Key Chain Hole. Made from magnesium and iron, 5000-12000 times to flint fire. Lightweight, space-saving ad easy to carry, with Flint /Bottle Opener/Scraper 3 functions. Made from tungsten steel for superior strength & portability. Break a window/ glass, escape in an emergency situation. The perfect pen for anyone who is into survival, hunting or outdoors as well as military or emergency services personnel.  Be ware!  beagle is the only authorized seller for the brand Aitken. Any other sellers selling this product is fake ! this is a gift, We really hope you could send the best quality gift for the one you care about ! Breaking car glass in emergency & signal to rescuers -the tactical pen is prepared for breaking car glass in emergency, also can be used for self defense and normal writing. 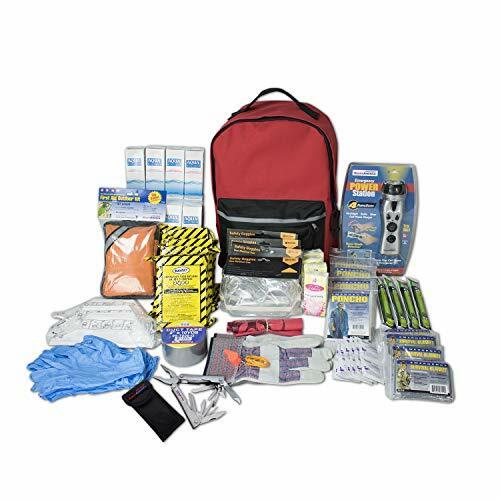 70385 Features: Pack includes sufficient lifesaving supplies and more for family of four. Also includes: 4 survival blankets, 4 ponchos, first aid kit (107 pieces), leather work gloves, 4 goggles, 4 Noish N-95 dust masks, multifunctional tool with pliers, 12-hour emergency snap lights, emergency whistle, emergency communication plan, duct tape - 10 yards, and bio hazard bags. 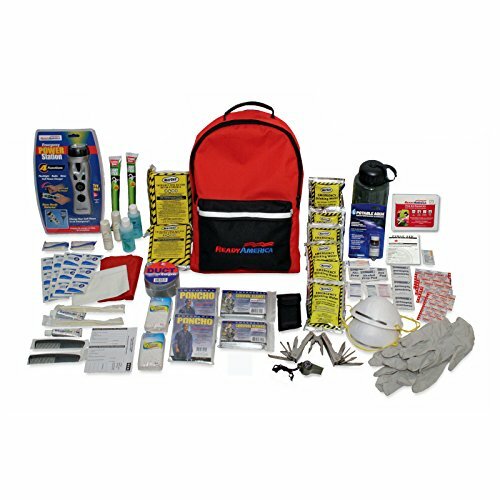 Be prepared for anything with Ready America's 3-day Deluxe Emergency Kit. Unique to the kit are an Emergency Power Station, 10 yards of duct tape and multifunction pocket tool with pliers. Nowadays with governments advising us that we should be self-reliant for at least the first 72 hours after a disaster, it's absolutely essential that we have emergency supplies at our disposal. That's why Ready America has developed a 3-Day Deluxe Emergency Kit for 2 people. It contains all the life saving supplies and more that two will need to survive for those crucial 72 hours. The kit includes the basic supplies including US Coast Guard approved emergency food to sustain two people for three days. Unique to the Deluxe 2-Person Emergency Kit are a few extra items - Water Purification Tablets, one 32 oz. BPA Free Water Bottle, Personal Hygiene Kit, Emergency Power Station, Multi-Function Pocket Tool with Pliers, and more. The Emergency Power Station is a four-function hand-crank unit that features a flashlight, AM/FM radio, cell phone charger and personal alarm. One minute of cranking produces either 30 minutes of bright light, 2 minutes of talk time on a cell phone, or 15 minutes of radio. The Multi-Function Pocket Tool with Pliers includes screwdrivers, pliers, file, wire snip, bottle opener, and knife all in one. All this and more comes in a convenient, durable backpack that can be stored in your car, home or office. Take it on camping trips and vacations so that you have it readily available in any situation. YOUR FAMILY'S PROTECTION IS OUR TOP PRIORITY - jogging early in the morning or late at night, having your teenage daughter out at a party or your kids coming home alone from school are all situations where safety is a major concern. With Kosin personal alarm, you can rest assured knowing that your loved ones are protected. A great choice for all ages: Women, Elderly, Students, Kids, Joggers, etc. It's also a necessory supply for traveling, hiking, camping and walking the dog, timely call for help, starting from the personal safety alarm. Dimension: 2.7 x 1.7 x 0.7 inch. Notice -- When the alarm sound begins to get quieter, or after you've been using for 12 months, please remove screws from back cover and install new batteries. 140db SAFESOUND PERSONAL ALARM: The emergency alarm can make a loud sound to draw attention to protect you from having an emergency even at distances as far as 606.9 ft. In addition, the sounds could last 50 minutes continuous ear-piercing alarm. HIGH POWERED: This Personal Alarm equips with 3 AG13/LR44 batteries for extended life! The AG13/LR44 batteries are the secret to this alarm's painful loudness. They'll last up to 365 days before you need to consider replacing them. MULTI-FUNCTION: With LED lights, the emergency alarms can be applied for night lighting, suitable for people at all ages such as students, elderly, children, women, night workers and so on; You can also use them for traveling, hiking, camping and dog walking at night. COMPACT AND CONVENIENT: The safety alarm keychain has a portable size for easy storage and carrying; It can be attached to women's bags, backpacks, school bags, belt loops, suitcases, keys, dog belts and so on; And you can take it even you are on the plane. ULTRA DURABLE & HIGH QUALITY: The KOSIN Portable Personal Alarm uses superior environmental and durable ABS plasticn, resistance to fall, crush and voltage, and high temperature, and the copper plug, not rusty, beautiful and durable, won't break in your most adverse conditions. The 130 dB sound capacity make you feel safe while walking on the street or travelling home late from work, have a walk without worrying about your safety. Essential goods if you live in a remote area, or afraid of being attacked; Just attach it to your bag or belt loop, and alert others when in danger. Why FORUSAFETY Emergency Personal Alarm? Extremely Loud - 130dB safesound siren alarm can draw people's attention even at a far distance. Smart and Compact Design - The smart design of the emergency alarm makes it easy to carry, attaches to bag, keychains or purse for easy access. Built-in LED flashlight - The safety alarm has a LED flashlight which is illuminating a dark area, find a keyhole or provide light. A Great Choice for - A personal security alarm will be a good gift for kids, women, elderly, students, joggers, etc. An excellent security option for any age. Easy to Use - Press the red button on the keychain alarm to activate the alarm and release it to stop it. No need to worry the alarm button will miss. Before you use, please remove the plastic tab on the back of the safety alarm. Press the red button on right side, alarm will be released. Press the red button to turn off. Press the white button to activate the LED light. 1. The safety alarm sound is very loud, please do not put by your ears. 2. When the emergency alarm sound goes low, please remove screws from back cover and replace new battery. 3. This button activated emergency siren is not completely waterproof, please do not put it in the water. SMART DESIGN: The safety alarm keychain is button activated, so you do not worry that the alarm switch pin is lost just like other alarms. Besides, Our emergency survival keychain for seniors features lightweight, tiny, fashionable yet elegant style with a carabiner, perfect to attach to your handbag, schoolbag, belt loop, backpack, suitcase, house car keys or dog Leash, while providing self-defense safety. STRONG SOUND: Our self defense button activated safety alarm for kids has a loud sound of 130dB which effectively helps to call for assistance in an emergency and deter attacker intruders immediately, sharp siren draw people's attention even in a far distance in the case of an emergency. 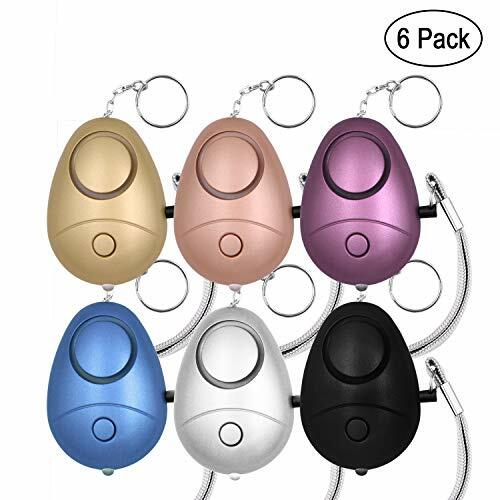 WIDE USE: The personal alarm keychain for women will be a wonderful gift for Students, Jogger, Elderly, Kids, Women, Night workers, a security necessary supply for traveling, hiking, camping and walking the dogs, warning device for kids and patient. Ideal for all ages. 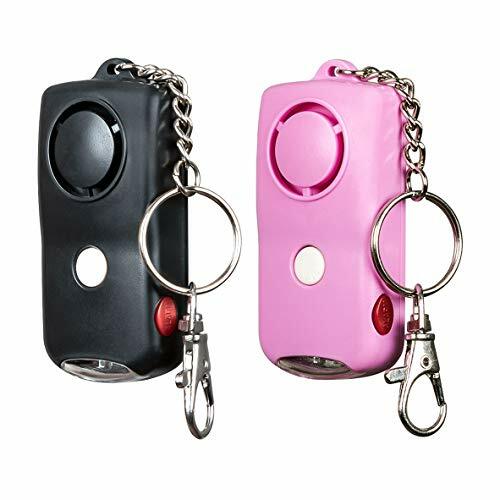 MULTI FUNCTION: This personal safety alarm includes a bright LED mini flashlight which offers instant illumination for walking path, car door lock, enjoy safe in the dark now, instant access keychain for personal SOS, accident fire. REPLACEABLE BATTERY: The personal siren alarm includes a 12V alkaline battery (# 23A) which is replaceable. The sos alarm is a deterrence item useful for multiple situations, prepare for your loved one, child, girlfriend, wife, parents, friends.